Facial feminization surgery (FFS) is a well recognized collection of facial reshaping procedures that is largely reductive in nature. 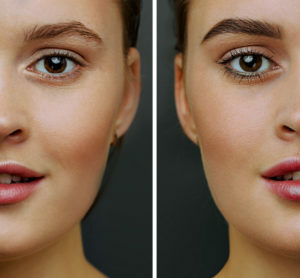 While most commonly associated with the male to female transgender patient, it also applies to non-transgender women who simply want to soften their facial features. It is a collection of mainly facial bony changes to reshape the forehead, nose, cheeks, jawline and trachea. A few soft tissues procedures also can be done like lip augmentation. In the Published Ahead of Print section of the March/April 2019 Journal of Craniofacial Surgery, an article was published entitled ‘ Evolution of Full Facial Feminization Surgery – Creating the Gendered Face With an All-in-one Procedure’. In this paper the authors describe their approach to facial feminization surgery in a single surgery to which they give it the name….all-in-one procedure. They describe their experience with this FFS surgery in forty-nine (49) patients over a fourteen (14) year period. Retrospectively they identified nine (9) patients, age 19 to 33 years old, who had this all-in-one FFS procedure. The average operative time was 280 minutes. (just under five (5) hours) All patients were discharged the day after surgery. No infections, wound healing problems, or nerve damage were reported. Patients returned to work within 30 days after surgery. But what thus paper does clearly show is that FFS surgery, no matter how extensive can be safely performed as an overnight stay. In addition FFDS surgery is associated with a fairly low rate of complications or adverse long-term effects.